There's nothing as iconic and captivating as a steam locomotive. So it's no wonder that long after they've gone from being part of everyday life, steam remains popular in model trains of all scales. Unlike diesels which were often built to multi-task, most steam locomotives were specialized machines. So if you're looking to add steam to your roster, these links will help you match the right engine to the job and complete the story for your model railroad. Reading and Northern Pacific No. 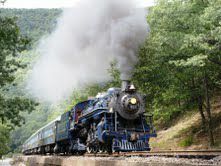 425 leads an excursion through the beautiful Lehigh Gorge. Although not a true USRA light Pacific, the locomotive is similar in design. ©2013 Ryan C Kunkle, licensed to About.com, Inc. Whether its the crack varnish or the local commuter, passenger steam locomotives needed to balance power and speed. The best did it with a style and flair that was bigger than life and left a lasting impression on our lives and our art.These locomotives will be the pride of your fleet too. In a scene very much like one which could be found on this railroad, a Russian Decapod steam locomotive (Bachmann) drills hoppers at the mine (Walthers New River Mine with added details.). ©2013 Ryan C Kunkle, licensed to About.com, Inc. Raw power at its best, steam locomotives assigned to freight service could shake the ground and stir the senses with their immense size and sound. From small locals to heavy coal drags to fast merchandise forwarders, all freight trains and freight locomotives were not created equal. The "York" recalls the era when President Lincoln rode the Northern Central's rails to deliver "a little speech" in Gettysburg. The beautiful locomotive was completed in 2013 - 150 years later. ©2013 Ryan C Kunkle, licensed to About.com, Inc. There were some locomotives that could cross the line between passenger and freight work. From lighter locomotives that could handle smaller "mixed" trains to the large high-speed freight engines that could pinch hit on a heavy passenger train, these versatile iron horses could roam wherever needed. Reading 1251, an O-6-0T, has the distinction of being the last steam locomotive retired by a Class 1 railroad in the US. Used until the 1960s in the Reading Shops, it later pulled excursion trains(with an added tender!). ©2013 Ryan C Kunkle, licensed to About.com, Inc. It wasn't all glory out on the main line. Steam ruled the yards and the docks too. These smaller switchers toiled long hours making up freight and passenger trains and delivering freight to customers. While the big articulated monsters and streamliners stole the spotlight, there's nothing like the sights and sounds of a switch engine starting a heavy cut of cars. Not all Shay's were small and light. Western Maryland No. 6 is the largest Shay ever built and one of a small few built for common carrier railroads. ©2013 Ryan C Kunkle, licensed to About.com, Inc.
For power you could take anywhere, geared steam locomotives provided the perfect solution in an often unorthodox design. Most common in logging, mining and industrial operations, these interesting machines could climb hills and navigate tracks that would derail traditional steam. These locomotives have developed a sort of cult following among steam fans and modelers - once you see one in action it's easy to see why! Aside from being a "fireless" steam locomotive, Bethlehem Steel 111 is typical of the size of most 0-4-0's. The locomotive did not generate its own steam and therefor lacks a tender or water tanks (or a boiler for that matter!). ©2013 Ryan C Kunkle, licensed to About.com, Inc. Steam without fire? These locomotives fed off a stationary boiler for the ultimate in operating efficiency and safety. They were so efficient many lasted decades longer in service than their conventionally-boilered brethren. A G Gauge 2-4-4-2 Mallet shows a typical look for these lighter articulateds used on many logging railroads. ©2014 Ryan C Kunkle, licensed to About.com, Inc. Although the term is sometimes applied to all articulated steam locomotives, a true Mallet uses exhausted steam from one set of pistons to power a second set for added efficiency. Mallets came in a variety of sizes and wheel arrangements. Their ability to pull heavy loads and navigate tighter curves makes them a popular modeling choice. Santa Fe 1880 is preserved near the rail yard in Newton, Kansas. The AT&SF was one of the few large American railroads which made big use of the Prairie type. ©2013 Ryan C Kunkle, licensed to About.com, Inc. Steam locomotives are identified and named by their wheel arrangement. The Whyte system makes it easy to organize your stable. Although it was built to serve steam, several turntables continue to spin modern locomotives. ©2013 Ryan C Kunkle, licensed to About.com, Inc. If steam had a downfall it was the nearly constant need for maintenance. Servicing steam locomotives required an army of workers and many specialized buildings. These can make for some interesting modeling projects as well. Proper lubrication can keep a locomotive running for a long time. ©2012 Ryan C Kunkle, licensed to About.com, Inc. Your model steam locomotives need care too. While you don't need a roundhouse or coaling tower, this article will give you the how-to on keeping your locomotives out on the rails. This small Porter tank engine is about as cute as a model train can get. The instant popularity of Bachmann's On30 scale is easy to understand. ©2011 Ryan C Kunkle, licensed to About.com, Inc. Tank engines weren't just a child's favorite companion. Loading the water and fuel supply on the locomotive instead of a separate tender conserved space and added weight for traction. Tank engines came in all sizes, from 0-4-0s to Mallets.